England faced the prospect of staying two hours away from the Pallekele International Cricket Stadium in Kandy. 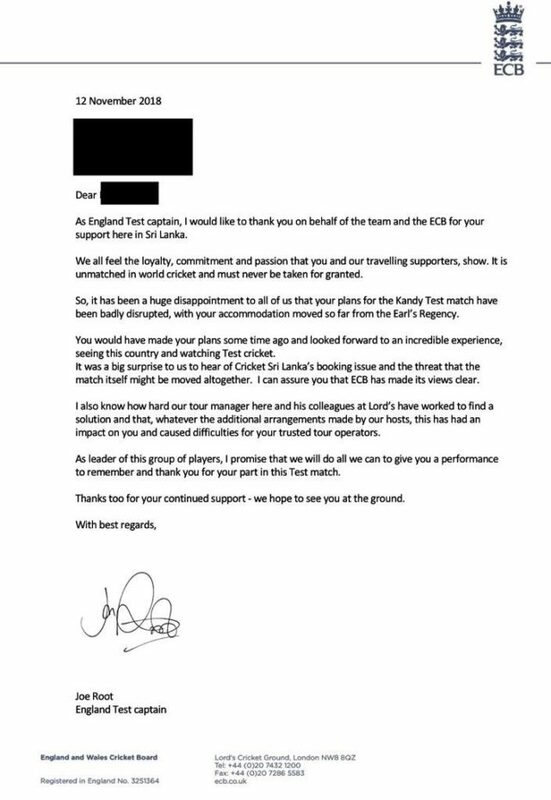 England captain Joe Root has written to thank travelling fans who were relocated from their accommodation in Kandy to make way for the team during the ongoing Test against Sri Lanka. It emerged last month that the hotel both teams were expecting to stay in, the Earl's Regency just 15 minutes away from Pallekele Stadium, had not been secured by Sri Lanka Cricket and had instead been fully sold to tour groups attending the match. Contingency plans, including the players staying two hours away in Dambulla and even moving the fixture to Colombo, were floated and rejected and only after the intervention of sports minister Faiszer Musthapha were the teams installed at their preferred lodgings. The outcome was less pleasing for around 100 displaced supporters, though their booking would hardly have been more satisfactory had the match itself been adversely affected. A series of compensatory measures were put in place, from free travel to and from their new, more distant accommodation, to hospitality lunches at the ground down to the more prosaic offering of complimentary fruit platters. England also decided to show their appreciation, posing for an on-field picture with the tour group before the afternoon session on day two, while Root individually signed letters for those affected. His message read: "It has been a huge disappointment to all of us that your plans for the Kandy Test have been badly disrupted, with your accommodation moved so far away from the Earl's Regency. "It was a big surprise for us to hear of Cricket Sri Lanka's booking issue and the threat that the match itself might be moved altogether. I can assure you the ECB has made its views clear. "As leader of this group of players, I promise that we will do all we can to give you a performance to remember and thank you for your part in this Test match."